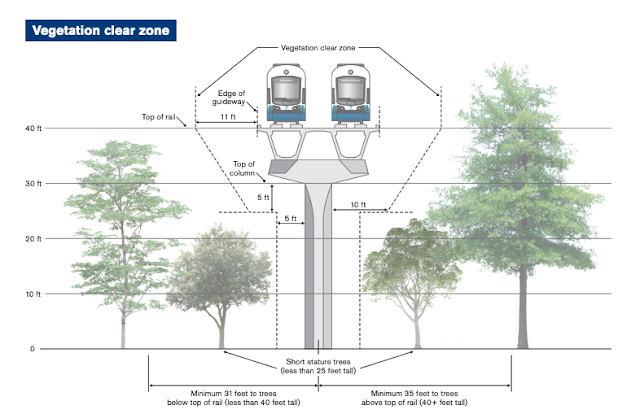 Sound Transit has been working with the Washington Department of Transportation to negotiate tree replacements along the light rail development corridor. Most of the track is on the ground. Tree removal 35 feet on either side of the track is required, resulting in the removal of over 1,000 trees from Washington Department of Transportation property, City right-of-way, and from individual property. Approximately 2,700 native trees and over 1,000 non-native trees will be replanted to meet or exceed City of Shoreline replacement requirements. All of the trees will come down at once in March 2019. A partnership with King Conservation District would allow funds from Sound Transit to offer a package of trees and shrubs to private land owners for a landscape buffer in areas where the code requirements for landscape buffers do not apply along the rail. This could contribute roughly 400 additional trees in the Ridgecrest neighborhood and portions of North City and Ballinger. Final designs will be shown at an open house in February. The last opportunity for public comment is prior to the final issuance of permits. Early work, expected to begin in March, involves tree removal, noise barriers, staging equipment, moving utility lines, and demolishing remaining houses. Neighborhoods will be notified by direct mailings and articles in Currents as well as door-to-door outreach. Actual construction will begin mid-summer. The Board would appreciate talking points on this topic including the facts related to the project. Sound Transit is taking measures to survey for bird nests in existing trees and to deter initial nesting habits. The Department of Fish and Wildlife is guiding that effort. Comments and questions can be directed to Ms. Nammi through shorelinewa.gov/lightrailpermits. Replacement trees should be the same species. Killing thousands of trees protecting tens of thousands of people for a few light rail riders. This is becoming an even greater level of insanity. Outrageous. The figure for the carbon sequestering units is off the charts. Air quality in Shoreline is going to drop severely. Shameful. Trees we will never see in our lifetime. It's unfortunate, but it's a reality. 3,000 saplings are not 50 year old trees. So it goes. Taking out thousands of trees that protect people and the environment and replacing them with saplings and shrubs?! Doesn't that just sound a little bit ridiculous. We used to have a nice little city here until Shoreline became greedy. The city doesn't care about its citizens all they care about is the Mighty Dollar. What about the noise and the wildlife? Do you know there are bald eagles that nest in those trees and various Hawks, woodpeckers Etc where will they go. I have another gripe and that's you coming in here and taking away all of our space to put up these ugly Townhomes that do not have to comply with code. They're built up two sidewalks they have no front or back yards. What the hell? What's going on here is a travesty. I am ashamed of the city of Shoreline. The light rail is the best thing to ever happen to Shoreline and greater Seattle. Can't wait until it's open. I am dismayed with the way that Shoreline has chosen to handle what is inevitable (growth) If you have had more than one child (or a couple who has had more than 2) then answer me this - where do you expect your children to live? And your grandchildren? I'm sure your anger and pain is real, but imagine if you can what it was like to the indigenous peoples that lived here before the orchards and chicken farms = before the "history" that is celebrated with Ronald Bog, Ronald schoolhouse etc. Consider yourself fortunate that within your lifetime you had a fairly bucolic environment. - All things pass. If there is not growth, there is decline. How do you think the folks in the abandoned cities and towns in the rust belt feel? The real problem here is that we are not setting aside land for parks and green spaces to be shared communally by all those living in apartments and townhouses. There should be more communal space, and fewer large fenced private yards enjoyed by one family only. It's hard to understand the reasoning for this. I'm so done with the decisions of Shoreline and Seattle in general. I plan on moving from this state this year. Too crowded, too expensive and now taking out 1000 trees. Why don't they take out some pawn shops on disgusting Aurora instead.